The kitchen is the hub of the modern home. 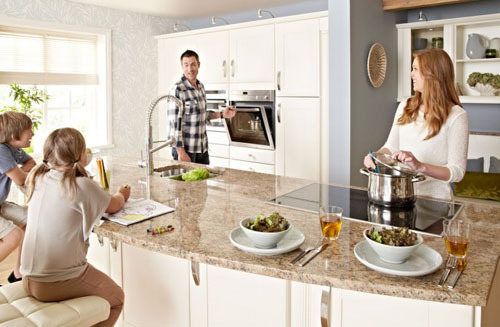 When designing and creating a luxury kitchen, therefore, spare no expense and opt for fittings that will not only look great, but provide long-lasting functionality. 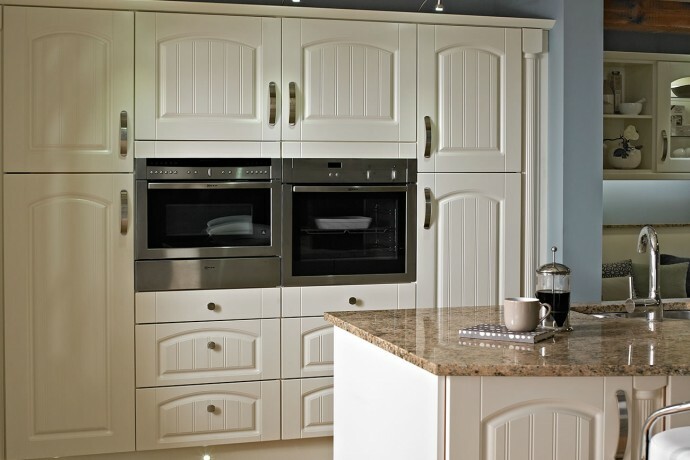 Below are a few things you’ll want to consider when fitting a new kitchen, with a focus on luxury. Whilst some small renovations are easily achieved on your own, a bigger job is best left to professionals. 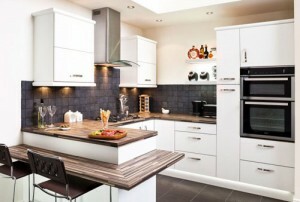 Betta Living offer free home design visits and discount luxury kitchen fittings and appliances. 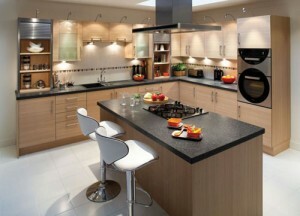 Your kitchen counters are arguably the most important aspect of a luxury kitchen. You’ll want them to be visually striking, and yet easy to maintain. When it comes to materials, there’s a lot to choose from. Granite and marble are popular classics and great to use as surfaces for dough making as they stay nice and cold. Concrete is an increasingly popular material for counter tops; it sounds ugly but it is remarkably versatile in terms of colour and finish, creating limitless customi sation options. Wooden surfaces are beautiful but require constant maintenance. Consider implementing a variety of counter top materials to cope with different tasks, but try to maintain continuity in the design.Freestanding appliances are bulky and ugly. Integrated appliances will create those sought-after clean lines. Whilst looking great, an integrated hob fits seamlessly into your counter top, making it easier to clean too. Hide distasteful dishwashers and fridges behind cabinetry that matches the rest of your kitchen. There are an increasing number of products that now come in integrated models, from coffee makers to beer dispensers. Find the right ones to suit your lifestyle and keep your surfaces mercilessly clean of clutter. The right cabinetry and storage solutions can add flavour to a luxury kitchen whilst keeping all that clutter behind a façade of regal splen dour. Choose a cabinet material that complements your counter tops. If you’re on a budget, consider using exotic materials like blackened stainless steel or burled mahogany on one or two accent areas, such as those which you see when you first enter the room, and choose a less expensive material for the rest. Soft-close cabinets and drawers are a nice touch that reduce some of the banging and clattering of everyday kitchen usage. When it comes to storage, there are a whole host of solutions on the market. Particularly striking are suspended pot racks, which you can hang over a counter or central island. You can show off your beautiful array of pots and pans whilst keeping them easily within reach. Shelves are great for displaying prized crockery, but a glass cabinet will do the same job whilst keeping lesser used items away from dust and grease. 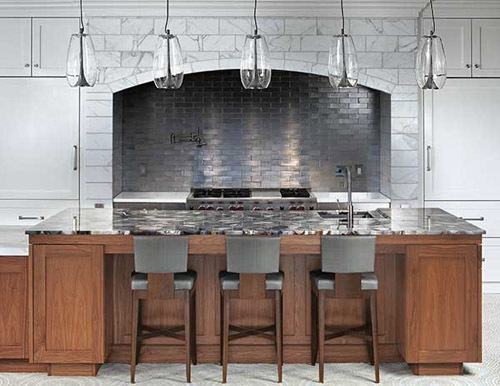 Lighting is the key to creating a luxurious ambience in any kitchen, so choose wisely. You’ll want brighter lights, perhaps LEDs, above work surfaces, and a more forgiving yellow light around dining tables or breakfast bars. Bright colours can fade easily in a kitchen, so choose neutral colours around high usage areas. Alternatively, install a coloured glass or acrylic splash back behind the cooker and surfaces for a finish that will last and is easy to clean. 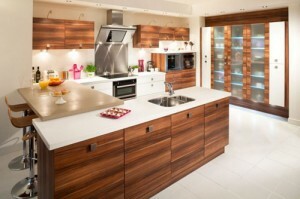 A luxury kitchen’s primary focus should be functionality. Traditionally, you should end eavour to make an equilateral triangle between the sink, cooker and fridge, to save you walking from one end of the kitchen to the other unnecessarily. And then there are the simple things, like keeping the mugs next to the kettle, and the cabinets where you keep crockery above the draining rack or dishwasher.I’m sad to say you’ll be spending a lot of time at the kitchen sink doing the washing up. So you may as well make the most of it. Opt for a dual sink if you have the space, with an integrated draining board to keep all the wetness in one place.